At present there is no cure for Sweet Itch. 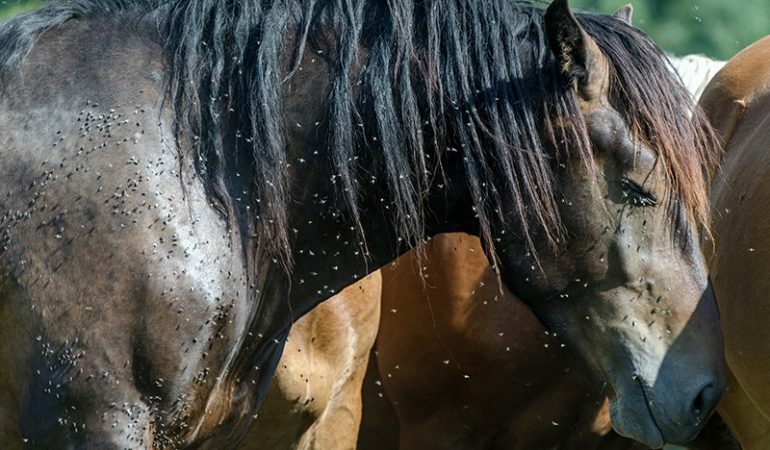 Once an animal develops the allergy it generally faces a ‘life-sentence’ and every spring, summer and autumn are a distressing period for horse and owner alike. The animal’s comfort and well being are down to its owner’s management. For slight to moderate cases of Sweet Itch this can help. However a seriously itchy, stabled horse has hours of boredom during which to think up new ways of relieving his itch – manes and tails can be demolished in a few hours of scratching against a stable wall. If stabling can be avoided it is best to do so. Use a fly repellent. Some are effective against flies but their effectiveness against Culicoides is unproven. DEET (Diethyl toluamide) is the active ingredient in many insect repellents for use by people, and it is an effective Culicoides repellent. Preparations containing DEET are available from leading pharmacies. Benzyl benzoate was originally used to treat itch-mites (scabies) in humans and has been used for many years to combat Sweet Itch. In its neat form it is a transparent liquid with an aromatic smell, but it is more commonly obtained from Vets or pharmacies as a diluted milky-white suspension. It is listed as an ingredient in several proprietary formulations, including Carr, Day & Martins’ ‘Kill Itch’ and Pettifer’s ‘Sweet Itch Plus’. Benzyl benzoate should be thoroughly worked into the skin in the susceptible areas every day. However it is a skin irritant and should not be used on the horse if hair loss and broken skin have occurred – application should therefore start before symptoms develop in the spring. If used later its irritant properties can cause areas of skin to slough-off, in the form of large flakes of dandruff. Other insecticides, including permethrin and related compounds, tend to be longer lasting but should also be used with care. Permethrin is available by veterinary prescription (e.g. Day, Son & Hewitt ‘Switch’ pour-on liquid). Application instructions should be followed. Note: Gloves should be worn when applying insecticides, including benzyl benzoate. Particular care should be taken if they are used on ponies handled by children – they can cause eye irritation, for example if fingers transfer the chemical from the pony’s mane to the eyes. Coat the susceptible areas of the horse with an oil . Midges dislike contact with a film of oil and they will tend to avoid it. Commonly used preparations include Medicinal Liquid Paraffin, and ‘Avon Skin-so-Soft’ bath oil (diluted with water). There are several oil-based proprietary formulations, for example Day Son & Hewitt’s ‘Sweet Itch Lotion’. Oils and other repellents that are effective usually work for a limited time: In summer a horse’s short coat-hair does not retain the active ingredient for long and it can be easily lost through sweating or rain. Re-application two or three times every day may be necessary. Some preparations contain substances (e.g. eucalyptus oil, citronella oil, tea tree oil, mineral oil or chemical repellents) that can cause an allergic skin reaction. Always patch test first on the neck or flank of the horse – apply to an area about 3 cm across and look for any sign of swelling or heat over a 24 hour period before using more extensively. Depressing the immune system with corticosteroids (e.g. by injection of ‘Depo-Medrone’ or ‘Kenalog’, or in tablet form as ‘Prednisolone’) may bring temporary relief but there can be side effects, including laminitis, in some animals. With time, corticosteroids may become less effective, requiring ever larger and more frequent doses. Applying soothing lotions to the irritated areas. Soothing creams such as Calamine Cream or ‘Sudocrem’ can bring relief and reduce inflammation, but they will not deter further midge attack. Steroid creams can reduce inflammation.